Our practitioners do a comprehensive assessment prior to providing any treatment to ensure we understand each person's individual needs and goals. Please visit or contact our clinic to discuss how we may be able to assist you. Can you claim on your health Fund? Our practitioners are registered with several private health funds, including MBF, BUPA, Medibank Private, NIB & HCF. Please check with us and your particular private health fund to see if a health fund rebate applies. Do you need help with managing symptoms of... Colds / Asthma / Bronchitis / Skin disorders / Allergies PMT / Menopause / Impotence / Infertility / Stress / Anxiety / Depression / Digestion / I.B.S. / Diarrhoea / Constipation / Limb & back pain / Sports injuries / Arthritis / Stiff neck / Frozen shoulder / Migraine / Chronic fatigue / Ear, nose, throat, mouth, eye ailments / Stress management / Insomnia / Some forms of paralysis / Weight control...? Individual results may vary. * Acupuncture: the insertion of needles in 'acupoints', often with the intent to help Qi flow smoothly. * Qigong: an energy practice, generally encompassing simple movements and postures. Some Qigong systems also emphasise breathing techniques. * Herbal Therapy: the use of herbal combinations or formulas that may be given with the aim to manage particular symptoms in the body. * Acupressure: the use of specific hand techniques used to apply pressure to 'acupoints' - a good alternative to acupuncture that does not use needles. The Theory of Qi: The true foundation of TCM is Qi, which is loosely translated as vital energy. In TCM, Qi is considered to be the force that animates and informs all things. In the human body, Qi flows through meridians, or energy pathways. Twelve major meridians run through the body, and it is over this network that Qi travels through the body and that the body's various organs send messages to one another. For this reason, keeping the meridians clear is imperative for the body's self-regulating actions to occur. Through proper training, people can develop the sensitivity to feel the flow of Qi. 5 element Theory: TCM believes that the human body is a microcosm of the Universal macrocosm. According to this theory, if humans follow the laws of the Universe, they may achieve harmony and improved health. The Yin/Yang and Five-Element theories are actually observations and descriptions of what ancients may have considered a Universal law. In ancient times, practitioners of TCM discovered complex sets of interrelationships that exist on deep energetic levels below the material surface. Over time, their insights developed into a unified body of wisdom and knowledge—TCM theories—and were applied to assist people with a way of life and an overall aim to help heal the human body. Even today TCM practitioners use these theories to better understand, diagnose and help treat individuals that come to them with a wide range of health problems. Meridian Theory: Meridians, or channels, are described as invisible pathways through which Qi flows that form an energy network that connects all parts of the body, and the body to the universe. 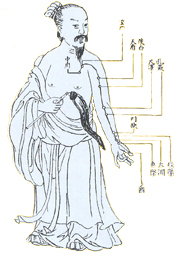 TCM understands that our body has twelve major meridians. Each one is related to a specific Organ System. The meridian network links meridians with each other and connects all body structures—skin, tendons, bone, internal organs, cells, atoms. TCM also believes that meridians connect the interior with exterior and the upper body with the lower body. This interlinked, animating network through which Qi flows freely makes the body an organic whole.